The Hotel Lumen is a mid-century modern hotel located across the street from Southern Methodist University in Dallas, Texas. 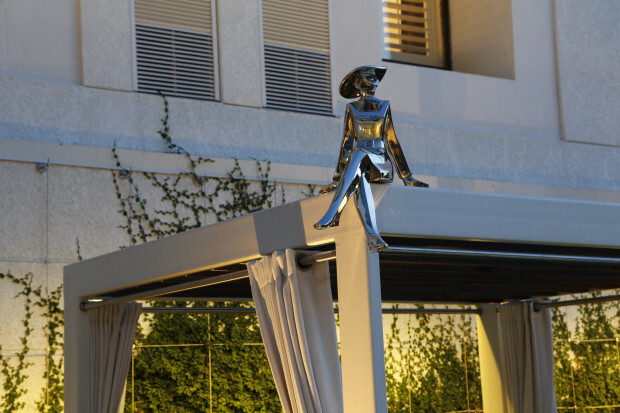 When this property underwent extensive renovation and expansion, the owners hired sculptor Brad Oldham to create an indoor/outdoor sculpture installation that would unite the remodeled and newly constructed rooms, along with the new restaurant, pool area, and rooftop deck. 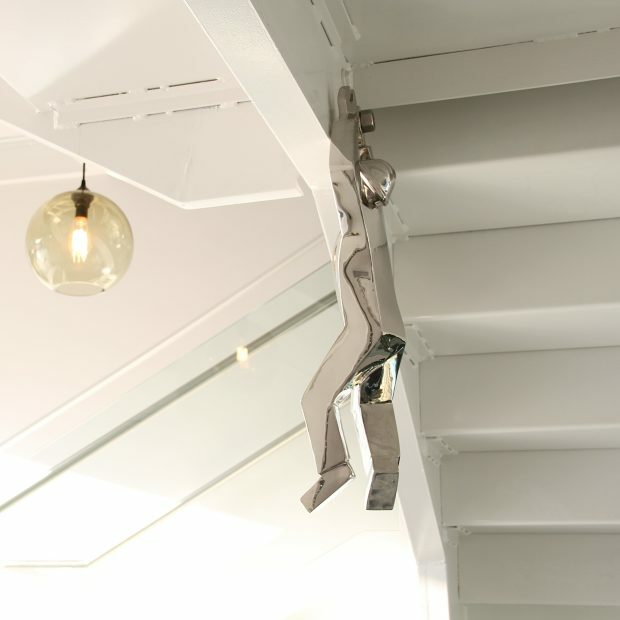 There are 28 sculptures discreetly installed throughout the public areas of the four-story property and its courtyards. Brad Oldham found inspiration in a 1970s ceramic piece by Jaru, in the name of the hotel, and in the hotel’s services and amenities. Lumen means light, and a well-known acronym for the colors in light is Roy G Biv. Oldham sculpted 7 archetypes that embodies various aspects of this boutique hotel to create the Lumen Light Team – Roger, Olivia, Yates, Mr. Green Jeans, Bancroft, Ingrid and Violet. The hotel is pet friendly, so he also sculpted a dog named Ray. 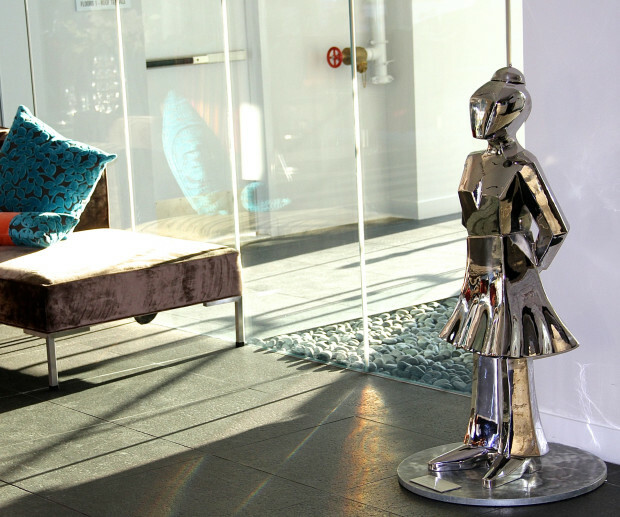 Each sculpture was ultimately created in at least two sizes and placed throughout the property to create a sense of discovery and delight. The faceted 28-piece installation is made in mirror-polished stainless steel; the sculptures reflect ambient lights and colors to dynamically change throughout the day and year. Oldham blended bold, playful sophistication in this project that appeals to business travelers, families and staff members who spend time in the hotel. 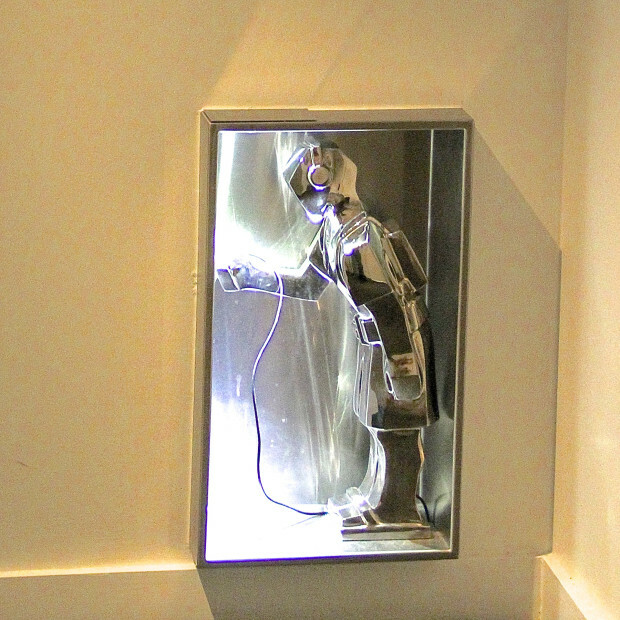 Guests ask about the stories behind each sculpture, take their pictures with the artwork, and literally see themselves in the reflective pieces. 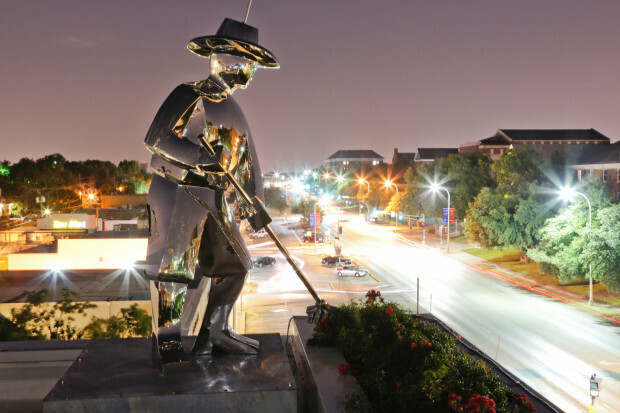 To the neighborhood, the 6 ½-foot-tall Bancroft sculpture atop the hotel has become a icon as he tends his rooftop garden. Brad Oldham and his partner Christy Coltrin met with the owner many times during the concepting phase of the project. 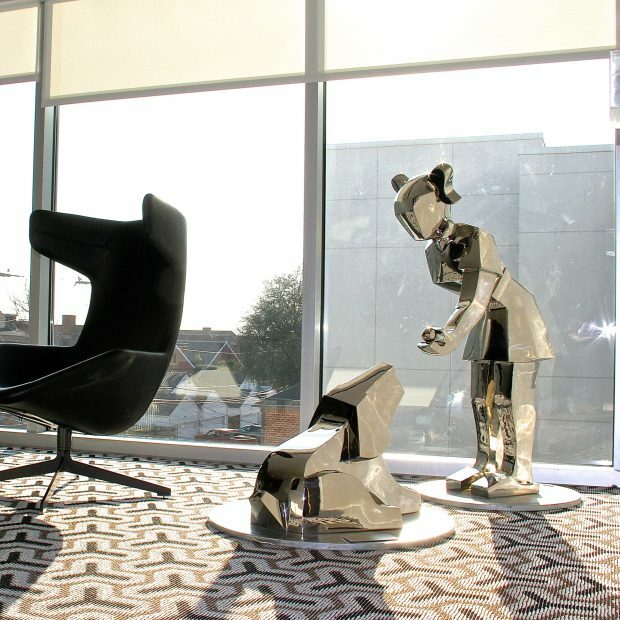 They developed a very tight creative concept with Brad sculpting maquettes as Christy wrote stories for each sculpture and its importance to the hotel and communication goals. The writing was informed by the sculpting as much as the written word influenced the visual outcome of each sculpture. The Lumen Light Team is a fine-art sculptural installation that was truly born of its installation site. The mirror-polished stainless steel was selected for the sculptures so the artwork would be very fluid and play with light. The material combined with the facets in the design result in a low-maintenance, low-tech, naturally dynamic installation that enhances a guest's experience at the Lumen Hotel.